The development of people or humans in the world is expected to increase as the years goes by, however, due to environmental issues, and how people choose to live their lives, bearing in mind that with every action they take concerning the environment, it has a future consequence on people around them. Human development is all about expanding the livelihood of people, in terms of freedom, to cope with the environment in a positive manner. If people of the world really want to make the world a better place to live for generations to come, there is the need to understand the link between environmental sustainability and equity. According to the United Nations report on human development for 2011, there have been remarkable progresses in human development over recent decades. The report aims at taking a bold step towards the reduction of environmental risk and inequality in the world. According to the Administrator of United Nations Development Programme (UNDP), Helen Clark, as a way of the UN achieving its aim on human development, the report identifies pathways for people, local communities, countries and the international community to promote environmental sustainability and equity in mutual reinforcing ways. The report defines human development as the expansion of people’s freedom and capabilities to lead lives that they value and have reason to value. It is about expanding choices. But promoting human development requires addressing sustainability. Locally, nationally and globally, this should be done in ways that are equitable and empowering. By means of sustaining human development, there was the need to expand the substantive freedom of people today, while making reasonable efforts to avoid seriously compromising those of the future generation. HDI is a combined measure of life expectancy, access to education and the standard of living. Even though good progress has been made in basic education and health, the standard of livng in many countries is still lagging behind. Unfortunately, much development has taken along side increasing environmental degradation – globally, nearly 40% of land is degraded due to soil erosion, reduced fertiliser and overgrazing. Land productivity is declining, with estimated yield loss at 50% in most cases. Agriculture accounts for 70-85 percent of water use, and an estimated 20 percent of global grain production uses water unsustainably, imperilling future agriculture growth. Desertification threatens the dry lands that are home to about a third of the world’s people, and some areas like the sub Saharan Africa are particularly vulnerable. Today, around 350 million people, many of them poor, live in or near forests, on which they rely for subsistence and income. Around 45 million people, at least 6million of them women, fish for a living, and are threatened by over fishing and climate change. To the extent that women in poor countries are disproportionately involved in subsistence farming and water collection, they face greater adverse effect of environmental degradation, the report stressed. Oct 17, 2011 (IPS) – Nearly all our food comes from the Earth’s limited food- producing lands, but those lands continue to be degraded, guaranteeing far higher food prices and less food in the future, experts warn. But degradation and desertification can be halted and reversed, as evidenced by once barren parts of Africa’s dry Sahel Region that are now green and thriving thanks to local efforts. Without reversing ongoing land degradation, studies show food prices are estimated to increase by 30% and that there could be up to 12% less food available. And we can’t afford to deplete our food-producing lands when there will be nine billion people by 2050. Every year, desertification results in the effective loss of some 12 million hectares of land. Local peoples responded by constructing semi-circular mounds, planting pits, knee-high dams and impoundments to trap and hold water, nourishing trees, bushes and food plants and helping to recharge groundwater. In some areas the water table has risen five or six metres. Using these techniques, small-scale farmers in Niger have been able to grow 200,000 tonnes of onions. Some are producing 2,000 kilogrammes of food from a hectare of land that did not produce anything. The big question now is how to bring this to other parts of Africa and the world? In Ethiopia, where large tracts of land owned by the country’s richest person were being ploughed up for a monoculture crop, the resulting clouds of dust blow away the land’s fertility. Semi-arid areas of the world need to shift into agroforestry that integrates trees animals and crops. To achieve truly sustainable forms of food production, governments need to move away from monocultures and large-scale irrigation projects. A combination of plants, trees and animals can conserve and enhance the productivity of land. Studies show that where agroforestry (also called agroecology) has been applied, it has led to an average of 116 percent increases in average yield in Africa. The best thing governments can do is support and provide incentives to their smallholder farmers to shift to agroecological methods rather than investing in big, expensive projects. Dams and large-scale irrigation are extremely costly for states, have huge environmental and social impacts and are unsustainable. Or that is what the headline says. But dig deeper and it is not the green wall that is a problem but its implementation. There are concerns that foreign species will be included, that biodiversity and indigenous people could both be under threat unless care is taken to involve local people in the planning. Starting this year, plants will be built in the desert to extract the valuable silicon from sand to construct solar panels. The energy to do this will be – you guessed it – solar power. Once these solar panels have produced enough silicon to make the the solar panels, then it is suggested that 50% of the world’s power can be obtained by solar energy by 2050. But the novel technological approach suggested by the Sahara “Breeder” team is not the only one under consideration by solar industry stakeholders as they seek to shape the development of the sector over the next half century. Every week during the pre-harvest season, poor farmers receive cereal as a credit. At the end of the season, farmers can pay back the loan with their own crops with 25 percent interest—an interest rate that the villagers picked on their own. Referred to as the African Market Garden, the new system will be implemented with about 7,000 small-scale farmers at 100 locations in Niger, Benin, Burkina Faso and Senegal, with the aim of extending the success of 3,000 gardens already established in countries of the Sahel during recent years. Support for the expansion comes from the governments of Israel, Italy, Switzerland and the USA and from the International Fund for Agricultural Development (IFAD), the World Bank, and various international foundations and NGOs. The African Market Garden benefits women particularly, who handle much of the region’s vegetable production and marketing, raising their incomes and enhancing family nutrition in a region where vitamin A deficiency is widespread. To irrigate a traditional vegetable garden of 500 square meters using the conventional system takes one man, lifting two watering cans at a time, about 4 hours a day or one woman, lifting only one watering can, about 8 hours a day, compared to just 10 minutes for drip irrigation. Using a solar-powered pump or other renewable energy source to provide water allows further savings and makes the system more sustainable. The new system uses water more efficiently which is necessary if the water table is not to drop and salt pans are not to develop. In Benin, three women’s groups have managed communal market gardens successfully, producing vegetables year-round for the last 3 years. Each woman generates, on average, just over US$200 per year from a plot measuring just 120 square meters. The profits are twice those for traditional gardening, plus the nutritional benefits of having more vegetables in the family diet. Young girls are especially happy with the new system, because they no longer have to spend hours fetching water for irrigation. Improved locally adapted varieties of okra, tomato and other vegetables resulting from their work are spreading rapidly in Niger and other countries of the Sahelian region. For the first time ever, markets in the nation’s capital, Niamey, were well supplied with vegetables, especially tomatoes, during the last rainy season. A new line derived from a local onion variety shows promise, yielding 60 tons per hectare, nearly twice as much as other varieties grown by farmers. 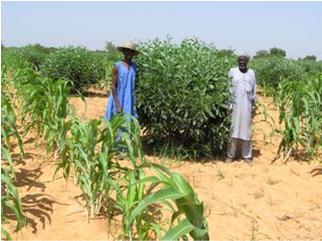 In a further effort to diversify farming in the Sahel, ICRISAT scientists are promoting vegetable intercropping with fruit trees. One especially suitable tree species is the Apple of the Sahel, or Pomme du Sahel in French (Ziziphus mauritania), whose apple-shaped fruit possesses ten times more vitamin C than apples and is also rich in iron, calcium, phosphorous and essential amino acids. Another is the Moringa tree (Moringa oleifera), whose leaves have seven times more vitamin C than oranges, four times more vitamin A than carrots, four times more calcium than milk (plus double the protein) and three times more potassium than bananas. 1. Use local food to add important nutrients to counteract malnutrition – in Burkina Faso porridge is being fortified with tamarind, soumbala (a local bean), fish and baobab fruit. 2. Helen Keller International, or HKI, is an NGO will distribute household drip irrigation kits to 300 families in eastern Burkina Faso. These families are planting gardens to grow nutritious vegetables. Drip irrigation is not widely used in individual gardens, but is common in commercial ventures. It uses 40 litres of water per day to irrigate a garden of 20 square metres while atercans for the same area would use 240 litres. 4. In Niger, the International Crops Research recommends fertilizer micro-dosing to improve yields during droughts. They apply a good pinch of fertilizer directly to the plant roots. Since using the method, the harvests have almost tripled. 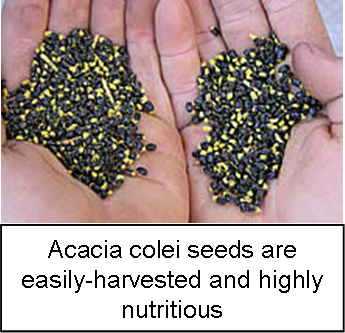 While acacias are found in Africa, varieties common in Australia have the added benefit of providing human food. In parts of the Sahel, and in particular in Niger, where deforestation seriously reduced the amount of trees between 1950s and 1980s and led in the agricultural areas to strong winds, ,high temperatures, soil erosion, infertile soils and desertification. Combined with rapid population growth and poverty, these problems contributed to chronic hunger and periodic acute famine. Whilst drought and crop failure is still a problem in Niger – the last severe famine was in 2005 – there are areas where farmers have been able to protect and regenerate degraded land and combat the effects of desertification. Building on twenty years of successful and sustainable agricultural approaches tried and tested by the Maradi Integrated Development Project (MIDP), farmers have been encouraged to take up an integrated agroforestry farming system. These involve a range of multi-purpose Australian acacias, other agroforestry trees, crop residue mulching and annual crops. Natural regeneration of trees by farmers, known as Farmer Managed Natural Regeneration (FMNR), has proved particularly successful. It provides firewood, building timber, improves crop yields, increases biodiversity and provides valued income to farmers. With this system, trees are owned by farmers and seen as beneficial and it is one of the few sustainable and expanding agroforestry systems in the Sahel. Meanwhile MIDP’s has also involved the testing and domestication of several edible Australian acacias. These perennial species grow rapidly, are well adapted to infertile soils and produce seeds that can be easily harvested and processed into nutritious human food. 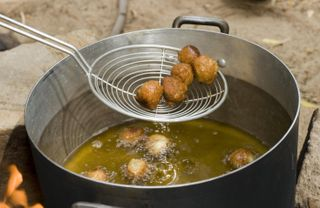 As a result, a significant number of communities in the area are known to be regularly consuming acacia-based foods, particularly derived from Acacia colei ( one particularly good speie). 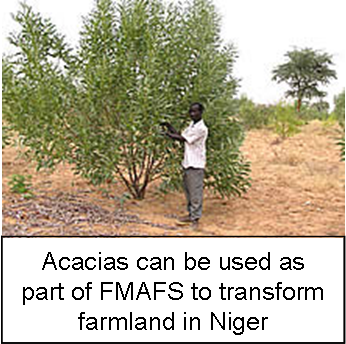 Take-up was slow until MIDP joined with World Vision Niger to launch a more concerted approach to promoting the multiple benefits of acacias. This developed into the Farmer Managed Agroforesty Farming System (FMAFS), which is an alley cropping, agro-pastoral forestry system that incorporates FMNR of trees along with high seed and wood-producing acacias.